Might make some interesting bowls or deep trays. This could be done with a lathe, a router with a bowl bit, by hand or even with a grinder (or any combination of the above. Lots of videos out there on how to carve bowls. Thank you, I will research some of those, I’ve never done a bowl so that might be a fun new project, thank you! I assume it is probably Douglas fir wood. Slice 2” thick cross cuts, glue together on edge and make a large end grain cutting board??? Turning bowls or making trays is a good idea but the wood grain is kind of boring. 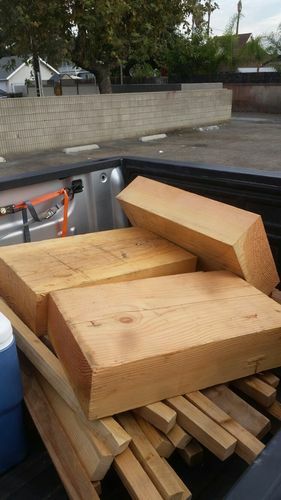 Here in Oregon where fir grows like weeds we us it for fire wood. that’s a great idea, I have been wanting to make a game cleaning station, so i could make end grain cutting boards for the top of the platform, thanks!